Bro. Edgardo Hugo Campos, FSF (b. 1970, Cordoba) is an Argentinian artist and a member of the Brothers of the Holy Family, a religious order established in France in 1835. The base of the Brothers in the Philippines is Davao City where their mission is education of the youth through the Gabriel Taborin College of Davao. Bro. Edgardo has lived and worked in Davao City for close to 18 years. 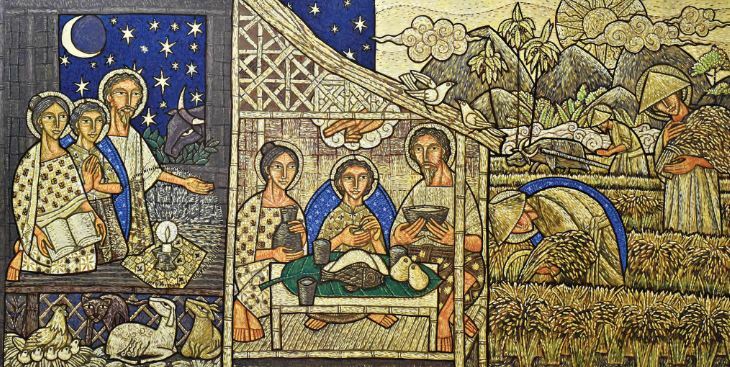 His paintings and mosaics can be found in the churches and chapels he designed in Davao City (Buhangin, Lasang, Matina, and Mintal), Digos City, and Flores Island in Indonesia. Apart from altarpieces and small panel paintings, he also has mosaic art on altar tables, tabernacle lights, and baptismal fonts. The artist uses mixed media on wood: acrylic, tempera, putty, beads and buttons and gold leaf. His works deal with Salvation history and the mysteries of the Catholic Church using a palette resplendent with the rainbow hues of Mindanao textiles. Associated with Romanesque and Byzantine styles, Bro. Edgardo’s works reinterpret Christian images, symbols, and scenes and pay homage to Mindanao culture in the same breath. Star Light, Star Bright: A Journey to Christ. An exhibit featuring the works of Bro. Edgardo Hugo Campos, FSF. 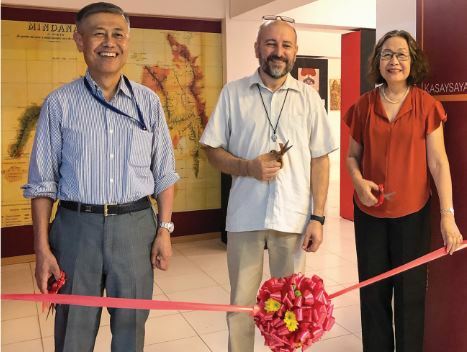 In subject and style, the works in this art exhibit hark back to the medieval era where faith and fervor reigned supreme. Bro. Edgardo Hugo Campos FSF recreates icons and scenes taken from the New Testament, inspiring quiet awe and reverence. Among Bro. 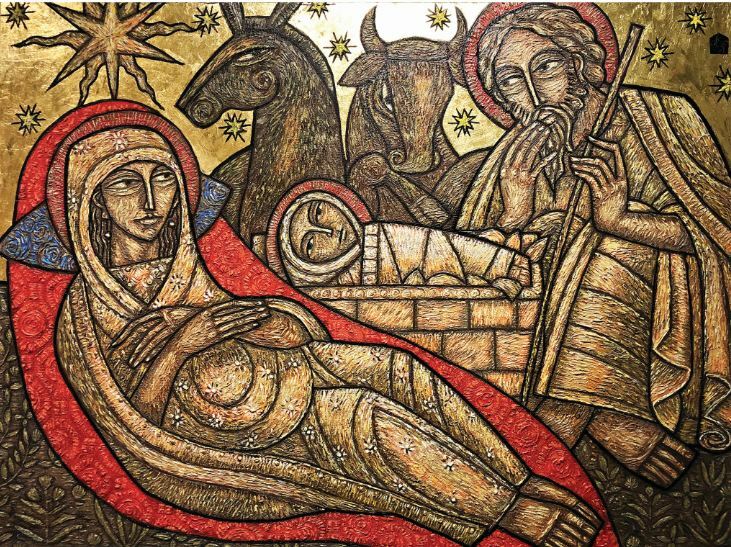 Edgardo’s devotional images are those of Jesus, Mary, and Joseph who also figure in scenes with narrative force and meaning. They search for an inn. Jesus is born in a manger. An angel proclaims the birth of Jesus to shepherds. Simeon takes Jesus in his arms and praises God. Joseph dreams about taking Mary and baby Jesus to Israel. While these holy personages have the solemn gaze of Byzantine icons, they are also situated in a Mindanawon context—the sun resembles an agong, rich textures and colors come from Mindanao textiles, and flora and fauna are distinctly local. Also familiar are the Christian symbols that give focus to religious thought: the hand of God, the fish and dove, and the stars. Allow the stars to light the way to Christ. Stop and gaze. Transcend the present moment, and experience the divine. The art pieces from top: Nativity, Pag-aampo and Holy Family Faces. Left photo: The artist with honored guests for the ribbon cutting: From left- Hon. Yoshiaki Miwa of the Consular Office of Japan in Davao, Bro. Edgardo Hugo Campos FSF of the Brothers of the Holy Family and Ms. Judy Ann Carpio Prantilla, President of the Davao Museum Foundation, Inc.